Colonial resistance to British control took many forms, perhaps the most effective was the general success of the non-importation agreements. 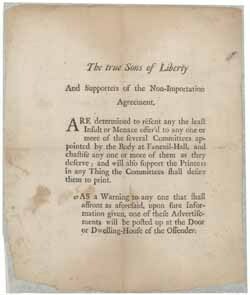 Such agreements appeared as early as 1766. They had a chilling effect on the British Merchants who traded with the colonies. The Stamp Act was repealed, eventually, based on appeals from Merchants who lost money shipping goods to a land that would not receive them. Not incidentally, the customs offices in the colonies could not collect taxes on goods that were either not allowed ashore at all, or were never sold. Non-importation agreements reached ultimate effect in response to the Townshend Revenue Act, when in 1768 Boston passed an act. Every port city and nearly every region would soon adopt acts like this one. 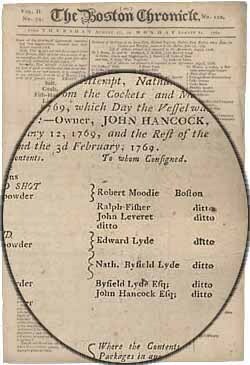 Finally, in 1774, the first Continental Congress of the colonies would pass The Association, a colony-wide prohibition against any trade with Great Britain. When new taxes were levied in the Townshend Revenue Act of 1767, Whig colonists again responded with protests and boycotts. Merchants organized a non-importation agreement, and many colonists pledged to abstain from drinking British tea, with activists in New England promoting alternatives, such as domestic Labrador tea. Smuggling continued apace, especially in New York and Philadelphia, where tea smuggling had always been more extensive than in Boston. Dutied British tea continued to be imported into Boston, however, especially by Richard Clarke and the sons of Massachusetts Governor Thomas Hutchinson, until pressure from Massachusetts Whigs compelled them abide by the non-importation agreement.